Our Estate 2.5 Carat Cubic Zirconia Cushion Cut Engraved Solitaire Engagement Ring features a 2.5 carat 8x8mm cushion cut that is set in this delicate estate styled solitaire. 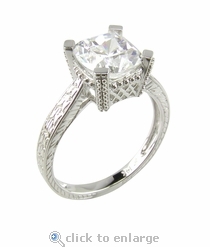 The four prongs are accented with a beaded motif and a lattice design is featured beneath the center stone. Additional engraved detailing enhance all three sides of the shank of this solitaire engagement ring for an estate style look. 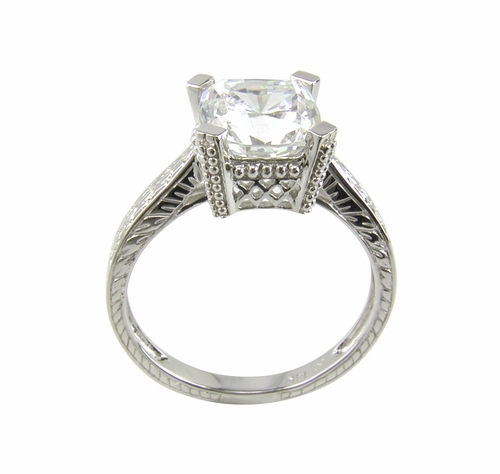 The stunning Russian formula cushion cut center is hand cut and hand polished with 104 sparkling facets. Due to extremely low pricing, all clearance sales are final. Clearance items may be sized for an additional fee. Please see menu options below. Sizing below a 5 or above an 8 is subject to additional fees. Please call for a quote.